In book two of the fast-paced Icarus Corps series, the Colonial Protection Forces wages war on the Conglomeration making a stand on Titan—and this battle may be the final one. The rapacious alien forces have taken their war to our solar system. Now that the human and PAC forces won a decisive battle on the moon, they need to try to head off the coming armada before their overpowering strength is amassed and The Icarus Corps is once again on the front line. But are they there just for fodder? And what exactly are they fighting for: Continued subjugation within the PAC or Earth first? 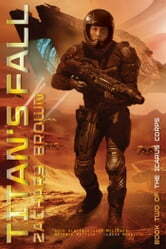 Book two in The Icarus Corps, Titan’s Fall continues the team’s adventures as they wards off a fierce race of alien conquerors as they fight for humanity’s place at the vanguard of of this galactic war.